Jerry Weldon is without question one of the greatest saxophonists on the jazz scene and the king of the Harlem "organ clubs." His years with Harry Connick, Jr., Lionel Hampton, Jack McDuff have proven him a jazz powerhouse time and time again. His hard swinging approach and unusual sense of dynamics are complimented by his great sense of humor. When Jerry plays everybody listens. 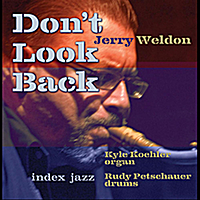 This collection of warm standards and a few burners features Harlem organ trio bandmates Kyle Koehler on B3 and Rudy Petschauer on drums.